1. Most new births in 2011 were children of color. As of July 1, 2011, 50.4 percent of our nation’s children under age 1 were children of color. Children of color have become the majority in this age range since the 2010 Census, when they made up 49.5 percent of the relevant population. In 2011, 49.7 percent of the population younger than age 5 was nonwhite, up from 49 percent in the preceding year. 2. This demographic change is especially evident in “gateway” states with high concentrations of people of color but it is also happening in nontraditional states. In 12 states and the District of Columbia, the majority of children under the age of 5 are children of color. At current growth rates several states, including North Carolina, Virginia, Colorado, and Connecticut, could become majority young children of color in the next decade. 3. A majority of all children of color live in California, Texas, New York, Florida, and Illinois according to the Children’s Fund. The majority of Hispanic children live in three states: California, Texas, and Florida. The majority of Asian/Pacific Islander children live in four states: California, Texas, New York, and New Jersey. 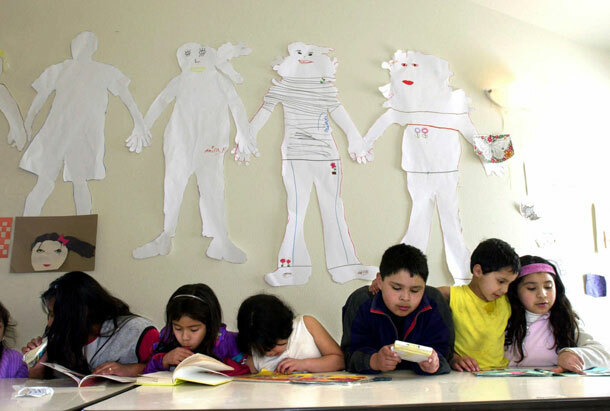 The majority of American Indian/Alaska Native children live in seven states. And the majority of black children live in eight states: New York, Florida, Texas, Georgia, California, Illinois, North Carolina, and Maryland. 4. Students of color are already the majority in many public primary schools nationwide. In the 2008-09 school year, nonwhite students made up 55.1 percent of enrollment in public primary schools in the nation’s 100 largest metro areas. 5. About 62 percent of foreign-born family households included children under 18, compared with 47 percent of native-born households. Multigenerational households—with three or more generations living together—were more common among foreign-born (10 percent) than native-born (5 percent) family households. Among the regions of birth, family households with a householder born in Latin America and the Caribbean were the most likely to include children under 18 (70 percent), followed by Africa (67 percent) and Asia (56 percent). 6. The vast majority—90 percent—of Latinos under age 18 are U.S. citizens. As of 2007 an additional 1 percent of them were naturalized U.S. citizens and less than 10 percent of Latino children under 18 years old were noncitizens. 7. Many children of color are growing up in bilingual households. In 2007, 55.4 million Americans 5 years old and older spoke a language other than English at home. A 2007 Pew Research Center survey found that fluency in English increases across generations among Hispanics. While less than a quarter of adult first-generation Latinos were proficient in English, 88 percent of second-generation Latino adults and 94 percent of third and higher generations were English proficient. 8. Birthrates among people of color provide us an economic advantage. According to the Independent Task Force on U.S. Immigration Policy, our nation’s high immigration levels have given the United States a global economic advantage. Unlike nations like Japan and many European countries, which have seen steady declines in their working-age populations, our nation’s strong immigration flow and high birthrates have helped the United States maintain a workforce capable of supporting a growing economy. 9. By 2050 the number of children will increase by more than one-third and the numbers of seniors will more than double. In every state at least one in five residents is a child. In 11 states there are at least twice as many children as seniors. In 2050 the nation’s population of children is expected to be 62 percent children of color. 10. Today’s children will grow up to become the nation’s workforce. By 2050 nearly half of the people in our workforce will be people of color. Our children today will shape our future and now is the time to invest in these communities. The Census Bureau’s projections show a transformation in our nation that is rapidly approaching. We need to make the success of children of color a priority to ensure our nation’s future success. Vanessa Cárdenas is the Director of Progress 2050 at the Center for American Progress.